LG's first induction range features electromagnetic energy generated by an induction coil reacts only with iron-like metals, not with ceramic surfaces. The pot absorbs the electromagnetic energy, and converts it into heat. Only the bottom of the pot is heated, which guarantees even heating, safety and energy savings. Plus, this range has LG's newest convection technology, ProBake Convection is up to 20% faster cooking vs. LG non-ProBake electric ranges. GE Free-Standing Ranges can be installed free from surrounding cabinetry thanks to their side panels offering a finished appearance. Included on this Dual Fuel Convection Range is the TrueTemp system that manages oven temperatures to ensure accurate, consistent heating and total cooking performance. It also features sealed cooktop burners that contain spills from dripping beneath the cooktop for the easiest cleanup ever. Plus, the sealed gas burner controls let you adjust flame height for various cooking needs. And the Steam Clean option allows you to fill the reservoir with water and clean the machine in just 30 minutes, without any harsh chemicals. 6.3 cu. ft. 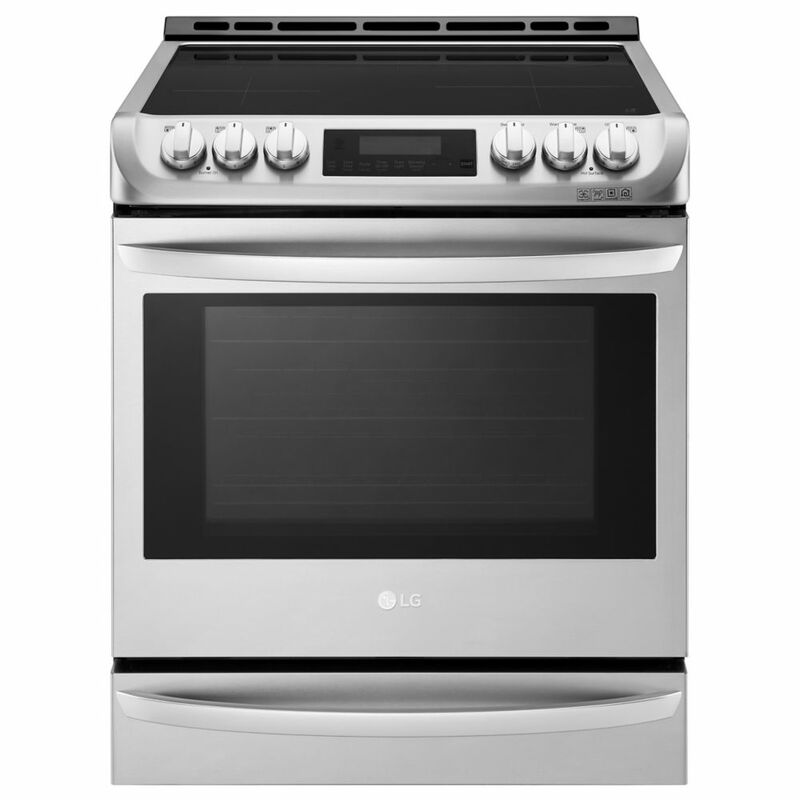 Induction Slide-In Range with ProBake Convection and EasyClean in Stainless Steel LG's first induction range features electromagnetic energy generated by an induction coil reacts only with iron-like metals, not with ceramic surfaces. The pot absorbs the electromagnetic energy, and converts it into heat. Only the bottom of the pot is heated, which guarantees even heating, safety and energy savings. Plus, this range has LG's newest convection technology, ProBake Convection is up to 20% faster cooking vs. LG non-ProBake electric ranges. 6.3 cu. ft. Induction Slide-In Range with ProBake Convection and EasyClean in Stainless Steel is rated 4.4 out of 5 by 10. Rated 2 out of 5 by IvanaJ from Easy clean option is not working. I bought this stove almost a year ago. Tried and easy clean option several times. When I follow instructions and turn it on it does not do anything. Water does not evaporate and it does not get warm enough inside to remove the dirt. Very disappointed. I love how it looks, I love the top, I haven't damaged it and it is easy to clean. Also rubber seal around top easily crumbles and gets damaged. And went for the oven has big holes and dirt gets in and can not be cleaned easy too. It is not recommended to use any chemicals to clean the oven, but what am i supposed to do? Hi Donny, thanks for your interest in our product! Yes, the range does include a power cable so that you can plug the unit into an outlet. Best regards. What type of outlet is needed for this stove? I currently have a gas stove. What happens to the hook ups for the gas? Can I purchase a back filler kit so I don&rsquo;t have a gap? I&rsquo;m going from freestanding to slide in. Do you also sell the side trim kit pieces?